Hop in! This innovative Savic Hop In Litter Box design features a top entry that is perfect for cats that stand while urinating. The extra-high edges ensure that none of the litter or waste comes flying out, even if your cat loves to scratch and paw at the ground. A particularly clever feature is the small perforated holes in the lid, whose edges are lightly tapered. This ensures that any stray litter stuck to fur or paws falls back into the litter tray as your cat jumps out, helping to keep your cat's toilet area clean and hygienic! The spacious tray features a 24 x 22 cm top entry, making the litter box comfortable to use even for larger cat breeds. The lid of the Savic Hop In Litter Box can be easily removed and hung on the side for cleaning. Grips on the underneath make it easier to lift and empty the tray. There is even a hook on the side that can be used for hanging up a litter scoop (not included). 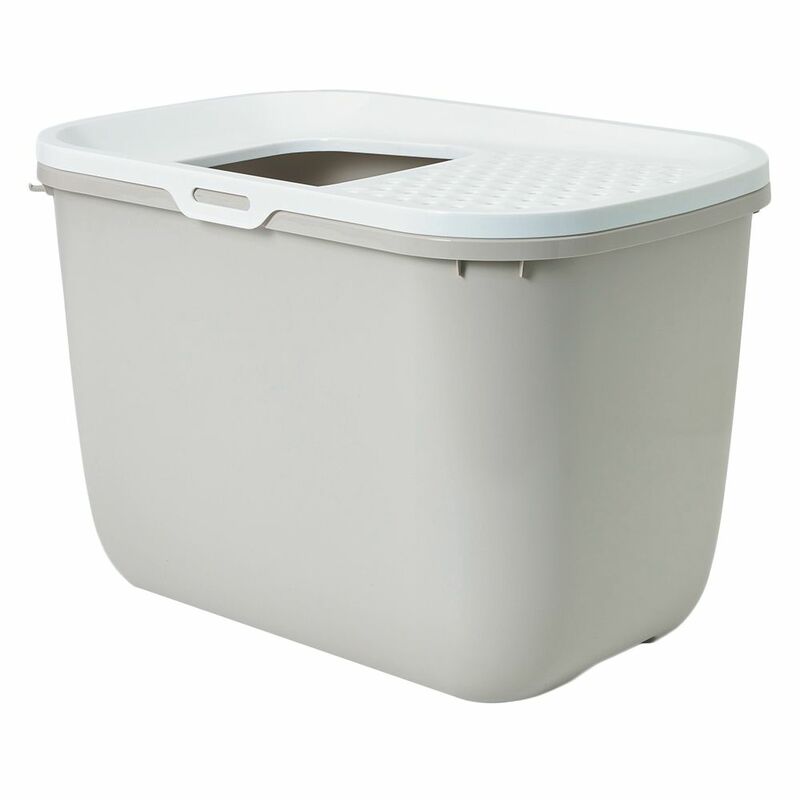 This well-designed Savic Hop In Litter Box will fit discreetly into any modern household. It looks neat and tidy, and can also be used in households that have dogs, as you can be sure the litter will stay safely inside. A tip for optimum hygiene – if you place the litter box in a corner, your cat will be forced to step over the perforated section of the lid, ensuring that almost all of the litter falls back into the tray. Savic Hop In Litter Box at a glance: Innovative cat litter tray with top entry Ideal even for larger cat breeds: a spacious tray with a large top entry High edges: making it particularly suitable for cats prone to strewing their litter around, as it ensures all litter, urine and faeces stays within the tray Perforated lid: with specially designed holes to ensure any litter on paws or fur falls back into the tray and keeps the surrounding area clean Easy to clean: the removable lid can be hung on the side to make it super easy to clean, with grip handles underneath to make lifting and emptying much easier With practical hook: for hanging up a litter scoop Modern design: in discreet colour and shape High-quality craftsmanship Even suitable for mixed cat and dog household: litter and waste remains safely out of the reach of dogs Made in Europe Colours: Tray: mocha or anthracite Lid: white Material: polymer Dimensions: Total dimensions: 58 x 38. 5 x 39.5 cm (L x W x H) Entry: 24 x 22 cm (L x W) Savic Bag It Up Litter Tray Bags are the ideal addition to a cat litter box. They are tear-resistant, transparent underlays that help to avoid build up of sediment or urine in the tray of the litter box or on the base. It helps to increase the life span of the litter tray and can combat bad odours. A litter tray bag also makes it considerably easier to clean a litter box.